Wn Tre09, Le Tréport, le Grange, Stp. Gruppe Le Tréport, K.V.A. 'E1', Houte-Normandie. Wn Tre09, Le Tréport, le Grange. R515. I do not know where this was/is. 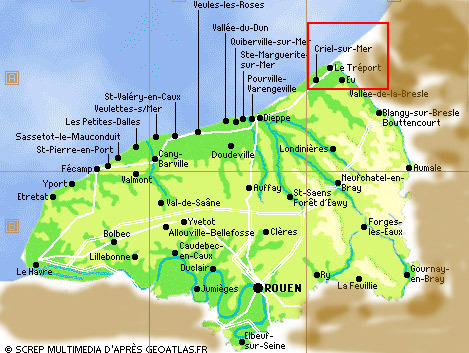 The plateaux above the town and Tre01 covers the southern way into the town. D126 looking towards le Tréport. The only gun position we found is pointed out by the red arrow. 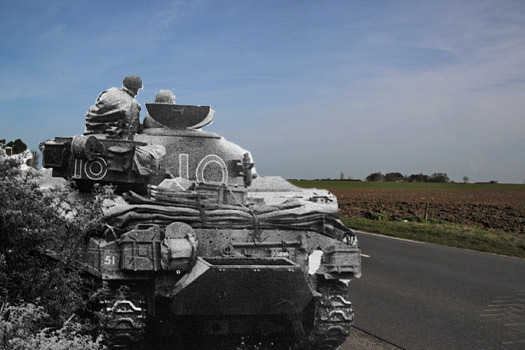 A Canadian Sherman tank coming up this road would have been blown sky high by the 7.5cm PaK in the R680 bunker. Shooting out of a casemate. The gun casemate would have been camouflaged and until the gun fired they would not see it. The range to here is 720meters. The Sherman's main armament has an effective range of 450meters. There would of been a half circle of seven Tobruk's, trenches, road blocks, two R630, one R515 casemates and lots of wire & mines. Tobruk there were seven here..
R680 casemate for a 7.5cm Pak gun. The 7.5cm & 8.8cm Pak guns became so big, heavy and unwieldy that they were gradually being removed from front line use and then were placed in casemates on the Atlantikwall where they became deadly. On D-day with an 8.8cm in Wn72 and then another at Wn61, with terrible crossfire. Where as if they had been in the open they may have not lasted so long. The 8.8cm is a very large gun. Inside a casemate on Omaha Beach at Wn61. Closer look at the R680. This photo is a 720 meter shot not too bad. Effective guns range	was 1,800 metres (5,906 ft) that would be ample for this 720 meters. This bunker would have had some trenches around the rear to enter the rear. The roof would have had earth on the top and grassed over. 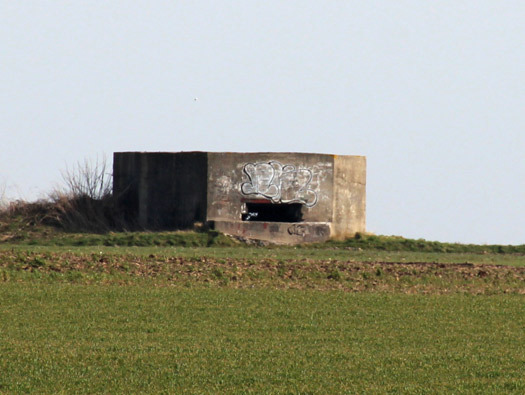 R622 twin group bunker at Cherbourg. 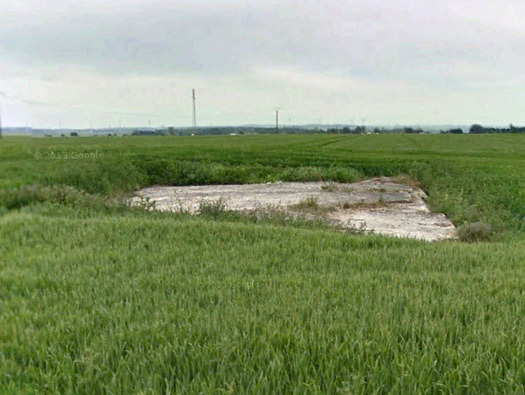 I think I have found nearly all the bunkers now via Google? 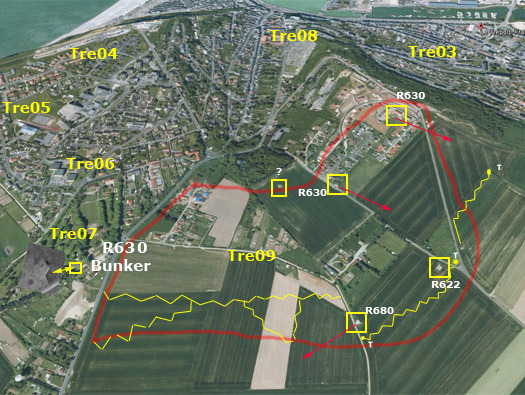 at Wn Tre09, Le Tréport, le Grange and an R630 in Tre07. The two R630's can be found one in a housing estate and the second in a garden, the R622 is in a field of crops and the R680 covers the plateaux. Also the trench system and 'T's are I think three of the seven Tobruk's. They still could be there. Crew room in a R622.